I get taken out for lunch everyday here, I love it. There were a few places I had wishlisted on the faithful foodie app Urbanspoon, before flying over to Sydney for the week. Buddha Bing was one of them so I was very pleased when A took me here on Tuesday. 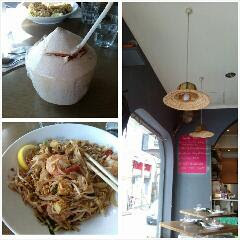 I pigged out on prawn Pad Thai with a sweet coconut juice to quench my thirst. Not quite. I wish there had been more juice. The weather in Sydney is amazing. Sunblock strongly advised. Own advise not taken into account though, naughty me.